FRANK J. FABOZZI, PhD, CFA, is Editor of the Journal of Portfolio Management, the Frederick Frank Adjunct Professor of Finance at Yale University’s School of Management, and a consultant in the fixed income and derivatives area. Fabozzi is a Chartered Financial Analyst and Certified Public Accountant who has edited and authored many acclaimed books in finance. He earned a doctorate in economics from the City University of New York in 1972. He is a Fellow of the International Center for Finance at Yale University. MOORAD CHOUDHRY is Head of Treasury at KBC Financial Products (UK) Limited in London. He previously worked as a government bond trader at ABN Amro Hoare Govett Limited and Hambros Bank Limited, and in structured finance services at JPMorgan Chase Bank. Choudhry is a Fellow at the Centre for Mathematical Trading and Finance, CASS Business School, London, and a Fellow of the Securities Institute. He has published widely in the field of fixed income and derivatives, and is author of The Bond and Money Markets: Strategy, Trading, Analysis. 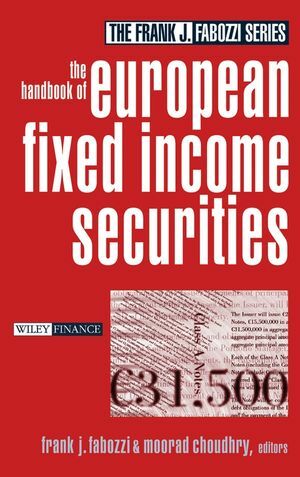 CHAPTER 1: Introduction to European Fixed Income Securities and Markets (Moorad Choudhry, Frank J. Fabozzi, and Steven V. Mann). CHAPTER 2: Bondholder Value versus Shareholder Value (Claus Huber). CHAPTER 3: Bond Pricing and Yield Measures (Frank J. Fabozzi and Steven V. Mann). CHAPTER 4: Measuring Interest Rate Risk (Frank J. Fabozzi and Steven V. Mann). CHAPTER 5: The Euro Government Bond Market (Antonio Villarroya). CHAPTER 6: The Eurobond Market (David Munves). CHAPTER 7: The German Pfandbrief and European Covered Bonds Market (Graham “Harry” Cross). CHAPTER 8: European Inflation-Linked Bonds (Barclays Capital Inflation-Linked Research Team). CHAPTER 9: The United Kingdom Gilts Market (Moorad Choudhry). CHAPTER 10: The European Repo Market (Moorad Choudhry). CHAPTER 11: European Residential Mortgage-Backed Securities (Phil Adams). CHAPTER 12: European Commercial Mortgage-Backed Securities (Phil Adams). CHAPTER 13: European Credit Card ABS (Markus Niemeier). CHAPTER 14: European Auto and Consumer Loan ABS (Markus Niemeier). CHAPTER 15: Structured Credit: Cash Flow and Synthetic CDOs (Oldrich Masek and Moorad Choudhry). SECTION THREE: Interest Rate and Credit Derivatives. CHAPTER 16: European Interest Rate Futures: Instruments and Applications (Brian A. Eales). CHAPTER 17: Interest Rate Options (Lawrence Galitz). CHAPTER 18: Pricing Options on Interest Rate Instruments (Brian A. Eales and Radu Tunaru). CHAPTER 19: Interest Rate Swaps (Frank J. Fabozzi and Steven V. Mann). CHAPTER 20: A Practical Guide to Swap Curve Construction (Uri Ron). CHAPTER 21: Credit Derivatives (Richard Pereira, Rod Pienaar, and Moorad Choudhry). CHAPTER 22: The Pricing of Credit Default Swaps and Synthetic Collateralized Debt Obligations (Greg Gentile, David Jefferds, and Warren Saft). CHAPTER 23: Fixed Income Risk Modeling for Portfolio Managers (Ludovic Breger). CHAPTER 24: An Empirical Analysis of the Domestic and Euro Yield Curve Dynamics (Lionel Martellini, Philippe Priaulet, and Stéphane Priaulet). CHAPTER 25: Tracking Error (William Lloyd, Bharath K. Manium, and Mats Gustavsson). CHAPTER 26: Portfolio Strategies for Outperforming a Benchmark (William T. Lloyd and Bharath K. Manium). CHAPTER 27: Credit in Bond Portfolios (Claus Huber and Helmut Kaiser). CHAPTER 29: Analysis and Evaluation of Corporate Bonds (Christoph Klein). CHAPTER 30: Legal and Documentation Issues on Bonds Issuances (Lourdes Villar-Garcia and Trusha Patel). CHAPTER 31: Trust and Agency Services in the Debt Capital Markets (Nick Procter and Edmond Leedham).